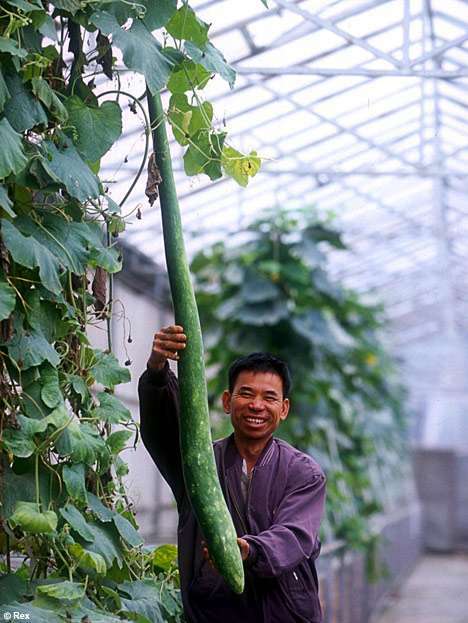 A cucumber derived from space irradiated seeds (Credits: Guandong Academy of Agricultural Sciences). Exposure to radiation is one of the well-studied hazards of spaceflight. But what if you could turn that hazard to advantage? That’s what China has attempted to do by sending plant seeds to space, then cultivating the resultant mutations. In early experiments begun in 1987 Jiang Xingcun, a scientist with the Chinese Academy of Sciences, discovered that spaceflight can increase mutation rates by hundreds of times that experienced on Earth. 12% of seeds sent to space in satellites manifested mutations of some kind in such experiments. Since that time, China has sent more than 400 plant seed species to space. The method has produced giant eggplants, half-meter long cucumbers, and peppers with improved yields and reduced seeds, among other products. Of course, not all mutations produce favorable results. “It’s not like that after traveling in space for a few days, the seeds will turn out with all the desired traits we want,” said Liu Min, a scientist who specializes in seed technology and consults for the China Academy of Space Technology. Scientists must isolate desired genes from the well-travelled seeds via a breeding program. The drive for advancing seed mutation is rooted in the need to feed China’s growing population. Currently, more than half of vegetable seeds planted by Chinese farmers are imported. Chinese agronomists are anxious to provide domestic alternatives. Scientists have also investigated Cobalt-60 induced mutations, but the radioactive material is hazardous and hard to come by. China is not the only nation to have experimented with radiation-induced mutation. Liu Min points to US roses, mutated via space exposure to improve oil yields, and to Russian cotton, wheat, and Christmas tree firs, modified in a similar fashion. Currently, the exact progress of space-induced mutation is not well identified, nor are potential hazards associated with use of the method. Products based on spacefaring seeds are not so labelled on the Chinese market. Could a Vegetable Compound Protect Against the Effects of Radiation?